September is a month of great change in the arctic. The brilliant reds and golds of tundra leaves quickly turn brown. Toward the middle of the month, there’s often frost every night. Perhaps the greatest change, however, is the light. September 4th is the first day since April that Nome experiences even a brief period of true darkness. By September 30th, it’s dark for more than seven hours a night. As we begin to experience the first tastes of the dark Alaskan winter, we thank you for helping to beam God’s Light throughout this vast region -- inspiration, education and companionship, 24 hours a day. May God bless you for your prayers and your generosity. PICKY! 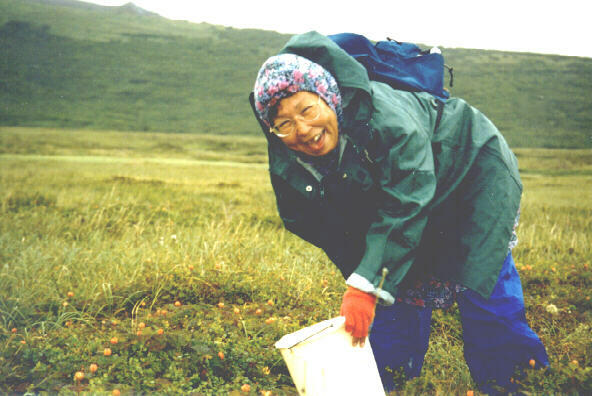 : Nome resident Leona Mayac (MY-uk) (left) scours for wild salmon-berries on boggy tundra 15 miles from Nome. The salmonberry is a staple of the village Alaska diet, one of three edible berries in abundance. It’s related to the salmonberry which populates the coastal western United States and southern Alaska. With the decline of fish in northwest Alaska’s rivers and streams, tundra plants like the salmonberry are even more critically important. Often, they are a village family's only source of vitamins. As you know, fresh or frozen “Lower 48” fruits and vegetables are too expensive for most village families to buy. In a single evening, someone like Leona, who has a lifetime of experience, can completely fill a gallon bucket. While picking is truly backbreaking work, a village family may put away 20 to 30 gallons of berries for the winter. INSPIRATIONAL SPOT: God, I offer You thanks for the gift of my family. Help us to work together in harmony and peace. Give us grace to accept each other as we are. Protect us from harsh words and hurt feelings. Lead us to encourage one another’s strengths and capabilities. May we always rejoice in each others’ successes. Watch over my family, Dear Lord. Bless us with hearts full of love, patience and kindness. Amen. top HOOFING IT UP: In August, the Federal Aviation Administration issued a Notice to Airmen cautioning pilots to check the Nome runway for reindeer before they land. Reindeer do wander onto the airstrip this time of year, though it’s been since 1968 that they've invaded the airport by the hundreds. THIRTY YEARS AGO: In September 1968, the city of Nome replaced its broken boardwalks with concrete sidewalks. Senator Ted Kennedy visited Nome, and, when walking into a particularly run-down neighborhood, was heard to exclaim “Oh, God!” in response to the terrible living conditions. The growing volunteer community for the new radio station enjoyed hosting actor Vincent Price and his wife. Price was a commissioner for the National Board of Indian Arts and Crafts. Meanwhile, the FCC set October 27th as the day they would begin processing the application for Nome’s new Catholic radio station. That led to hopes that the FCC would soon give permission to build. Discouraged by many bureaucratic delays, supporters would have been even more careworn had he known that the “green light” was nearly two years away. Meanwhile, September 1969 saw the largest Nome volunteer community to date (left). 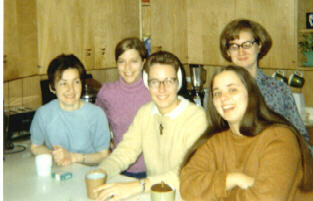 Front row from left: business manager Therese “Tweet” Burik, Sister Paula Cosko, fcsp, and Annie Legan, RN. Back row: Jeannie Stoklosa, RN and Father Jim Poole’s secretary, Kathy Prueher. Registered nurses, Annie and Jeannie worked at Nome’s hospital and lived as volunteers, donating their entire incomes to the radio station construction fund. Summer programs on KNOM included a series on helping teens to quit smoking and chewing tobacco. We discussed Nome’s new halfway house, opening to provide a buffer between jail time and the outside world. Four programs featured relationships between fathers and daughters and the roles which fathers play, as KNOM volunteer Michael Warren interviewed organizers of the “Dads and Daughters” nonprofit, including the editor of the “Random Acts of Kindness” series of books. We talked about how elders can become involved in the prevention of youth suicide and how to start a small business in a village. Other topics included hunger in the Bering Strait region, how to improve education, and a variety of health concerns like sunburn. It’s been a very busy summer over the air -- thanks to you. Father Mark Hoelsken, SJ (left) is KNOM’s Spiritual Director, shown during a rare, brief visit to Nome. 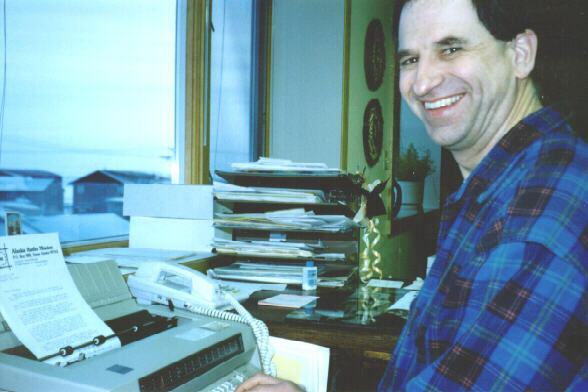 A Jesuit Volunteer for several years at KNOM before entering the seminary, Father Mark devotes most of his time ministering to the isolated villages of Chefornak, Newtok and Nightmute, for which he is visiting pastor. INSPIRATIONAL SPOT: Are you discouraged? Here’s a great message of hope. God chooses the last to be first. God chooses us not because of our abilities, but because of our inabilities, and our willingness to give glory to Him. Give God your best try. Let Him do the rest. full size OUR WHOLEHEARTED THANKS to everyone who contributed toward our two projects this year, the antenna booster distribution, and our emergency studio generator. Thanks to two large contributors, and many smaller ones, our distribution of 736 antenna boosters has made a noticeable difference in the number of villagers calling and writing KNOM. Every day, we hear from distant points that before the boosters, contacted us only rarely. With one large gift, and, again, many smaller ones, we were given just exactly what we needed for our new studio generator. The 66 kiloWatt generator has been ordered, and we plan to install it in September. By the way, if you plan on running computers on diesel generator power, talk to KNOM engineer Les Brown first. Les has become a guru on the subject. 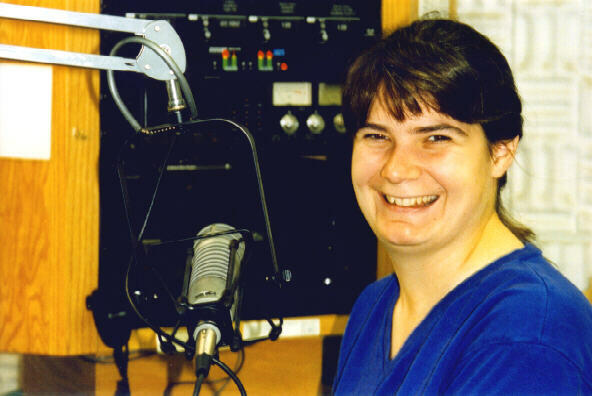 MASS APPEAL: A woman from the Yukon River village of Holy Cross contacted us last month, at the request of several elders, who wanted to express their appreciation for our broadcast of the Holy Sacrifice of the Mass early Sunday mornings. KNOM airs Mass twice, at 8 AM and 10:30 AM. It seems that the woman gathers with several housebound elders every Sunday morning to worship along with KNOM’s 8 AM Mass, which is provided to us by the Passionist Fathers. Then, having enjoyed the opportunity to pray the Mass with the older folks, the woman then attends the village’s late morning Mass to worship in person. Holy Cross is an Athapascan Indian village with sixty households, located about 240 miles southeast of Nome. There’s a fifty-fifty chance that a note you send to KNOM will first be opened by Connie Albers (left). A KNOM volunteer for two years, Connie now helps Florence Busch in the upstairs office. They’re expecting their first child February 14th!. INSPIRATIONAL SPOT: God told a discouraged Moses, “take these two tablets and call Me anytime." top OUR MISSION STATEMENT: KNOM is on the air to inspire, to educate, to inform and to encourage the thousands of Native Americans who live in Alaska’s remote villages. These outposts suffer poverty, suicide, domestic violence, alcoholism and diseases like tuberculosis and hepatitis at rates that are five to twenty times the U.S. average. About half of our listeners do not have running water in their homes. In a typical day, we broadcast about one hundred inspirational spots. You’ll hear an equal number of educational ones, too, plus ten minutes of news every hour, hours of interviews and other informational programs every day, the Rosary, and lots more, wrapped in an appealing blend of popular music and encouragement. We work to make a difference in our listeners’ lives, minute by minute. We’re owned by the Catholic Diocese of Fairbanks. Our only source of income is good people like you. NOME NEWS: TERROR AT SEA: 37 people, mostly Russian Eskimos whose American visas were expiring, left the Alaskan village of Gambell for home in 14 small boats. The trip to the Russian mainland normally takes about 6 hours. To everyone’s horror, the weather worsened, with waves to ten feet, hard rain and 30-knot winds. One of the boats capsized, drowning a father and son, and while most boats made it to shore over the next day, three remained lost in the steel gray Bering Sea, their six passengers without food, fresh water, or even warm clothing. Miraculously, they were located four days later, drifting about thirty miles off the Russian coast, everyone cold and wet, but alive. BEARLY NEWS: On August 13th, a grizzly bear cub was spotted two blocks from the KNOM studio, in the heart of Nome. It’s the first time anyone can remember a bear in the center of town. On October 16th, general manager Tom Busch will accept KNOM’s Gabriel “Radio Station of the Year” Award on your behalf. This is the fourth consecutive year that KNOM has won this top national honor, and, as you make our broadcasts possible, it rightly belongs to you. Thank you for your support and your prayers. May God greatly bless you!